A dear friend of mine shared this quote above on Facebook during the height of the protests surrounding the deaths of Michael Brown & Eric Garner. And though I believe she was speaking to the happenings that were occurring as a result of their deaths, it evoked a response in me in a completely different and unrelated way. (Even though I also agreed and supported it’s meaning for those cases.) I am a recovering yeller. It is really hard to say that (write that) out loud. I am not proud of it and it causes me a lot of guilt and shame when I fall off the wagon, so to speak. I think I have always struggled with constructively handling my anger (right, Mom?) but it has never really affected me too deeply (though it probably should have…) until I became a parent. It only took a few moments of really losing my cool with my children to lead me to Google searches such as: how to stop yelling or controlling your anger. There are two books I’ve been reading that have been really helpful in focusing my energy on being present and finding ways to release my anger and frustration without losing my temper. The first, written by parenting guru Dr. Laura Markham, is called Peaceful Parent, Happy Kids: How to Stop Yelling and Start Connecting . This parenting book has been really helpful to me because it focuses a lot on how to handle myself, not just how to change my children’s behavior. This is really the heart of the matter. My kids are not doing anything they shouldn’t be doing. They are just being kids. Their behavior is emotionally and developmentally appropriate. It is my frustration, anger, and yelling that has no merit and it is on me to change the way I react instead of changing the way my children behave. The second isn’t a parenting book. 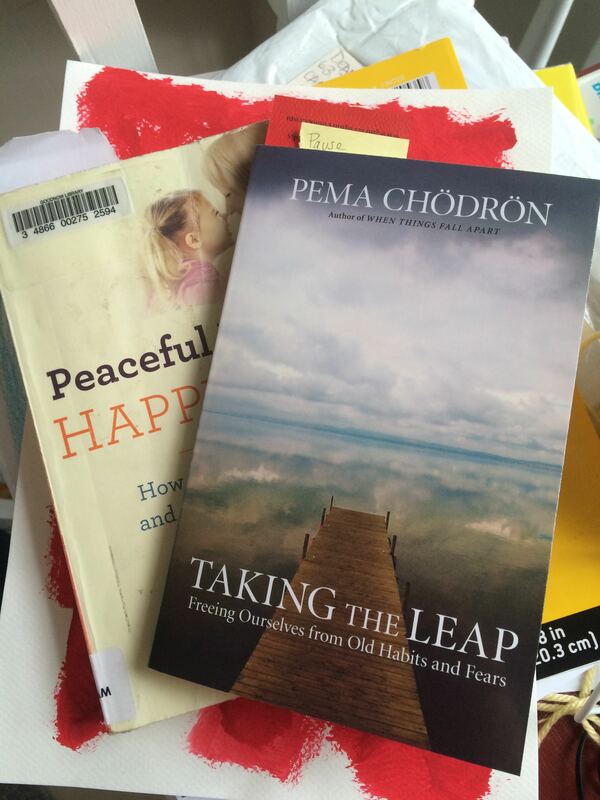 It’s written by an American Buddhist nun, Pema Chodron. Taking the Leap: Freeing Ourselves from Old Habits and Fears has been helpful for focusing on my own inner peace. I’m only half way through this book, but a lot of the advice is so simple, such as reminding me to pause and take focused breaths throughout the day. It is amazing how healing a few focused breaths can be. But in the hustle and bustle of the day, it’s simple moments like that that I can lose sight of embracing. This has led me to creating a visual reminder of my efforts of making peace in my mind and actions. 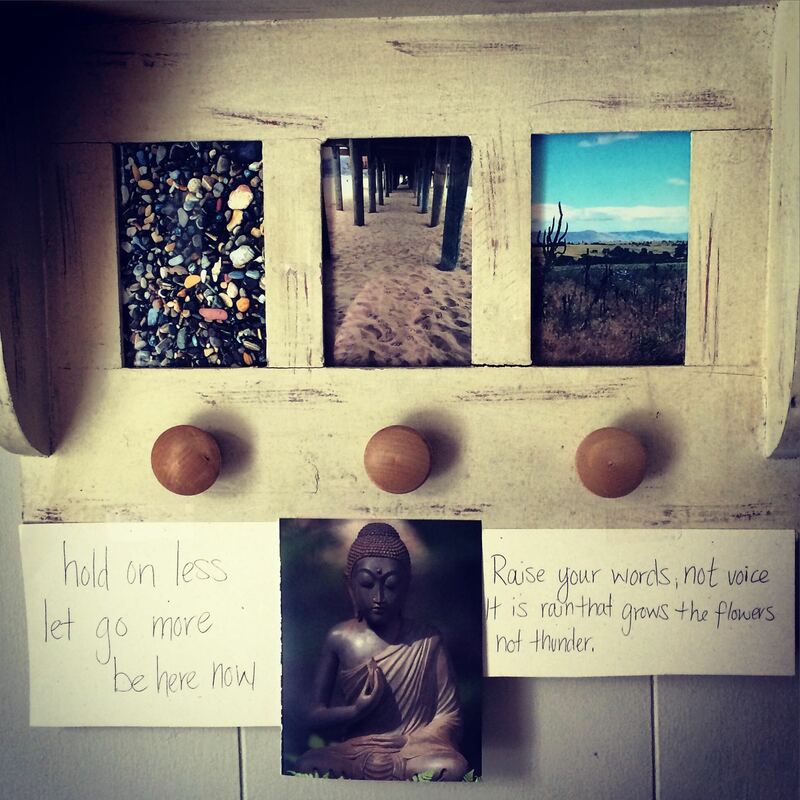 This one above my desk has quotes and images that help keep me focused and grounded. I probably need to set up a few more of these around the house so that it can be in my line of vision at other times than when I’m at my desk because this is not always when I need the reminder. These thoughts of peaceful parenting, controlling my anger and in general ways to better myself have been on my mind a lot in the past few months. Just a few days ago, I read this quote from Rebecca Eanes, who writes for Positive Parents. This really spoke to me because I realized that my kids make me want to be a better person. I want to be the best version of myself for them and of course, for me, too. Being a parent pushes me to do the work it takes to heal and fix the broken pieces within me. And that is hard work, but possibly the most important work I can do for myself and for them. I read this article about how there are really no such thing as grown ups and that some folks just do a better job of faking it. In a lot of ways I agree with that, but I don’t want to agree with it. It’s important to me to figure it out…to figure out how to really grow up, handle and manage life’s emotions and challenges in a healthy, mindful, peaceful way. Because I want to then be able to teach my kids how to grow up. Think about how great this world could be if we could really grow up and teach our kids how to grow up. He’s really mad at me because I want him to eat all of his green beans and fish. He claims that even though he’s still hungry, he’s just too tired to eat and the fish does funny things to his belly. But he’s totally down for some chocolate instead. Meanwhile, Little One is struggling with wanting to be in my lap and NOT wanting to be in my lap all at once. Because, you know toddlers can’t make up their mind. In the last few weeks I’ve experienced some of Big Brother’s anger expressed towards me for the first time, from giving me the cold shoulder to pushing me away or throwing something out of frustration. I have a whirl wind of emotions when this happens. My knee jerk reaction is sometimes the worst reaction and that is to yell. On good days, I pause and breathe. I remind myself that his reaction to his emotion of anger or hurt is appropriate because he’s not suppose to be grown up yet. I am. He does not yet have the tools to manage his anger and it is my job to teach him. So I am working hard to be the grown up he needs me to be. I am working hard to ease up the thunder and instead be the rain that nourishes him and provides him with what he needs to grow. How about you? What are your secrets to being a grown up? Love this. Just read ‘How to talk so children will listen and listen so they will talk.’ Taking a workshop on that now too. 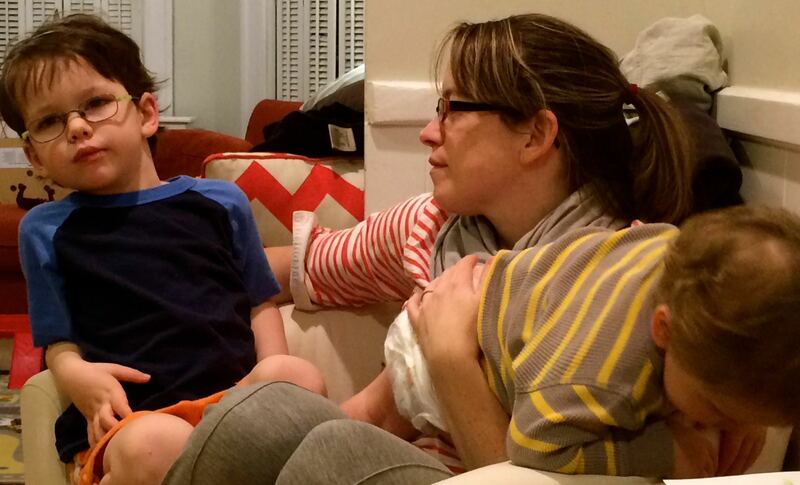 It’s amazing how much lighter I feel as a parent, taking a different, non – yelling (which I did a lot) approach. It’s harder to stop and think about how to react to my kids but the results are so much better and in the long run, easier. That book is on my shelf, too! I haven’t read it yet but it’s next up on my list. It is hard to break the yelling habit and one I focus on every day. But I know my efforts are worth it, for me and them. Thanks for sharing, Sarah! I (the mom), am learning so much from you (the child)! You are wise beyond your years grasshopper. I continue to be on the journey of “growing-up”! Coffee helps me. Thinking about Jennifer from playschool helps me too. She’s such a pro at handling the big emotions of little ones!! Yes, a good dose of caffeine can help at times and Jennifer is amazing!